Enemy: (noun) an armed foe; something harmful. You do whatever is necessary to protect yourself and your loved ones from enemy forces, right? You lock your doors to keep unwanted people from entering your home and vehicles. When you are sick, you go to the doctor for medication that will fight against “enemy forces” that are making you sick. Well, what are you doing to protect your mouth from its worst enemy? Dental plaque is the most destructive enemy inside your mouth. Plaque occurs naturally on a daily basis. If you have ever run your tongue over your teeth at the end of the day and felt a “fuzzy” film coating your teeth, then you know exactly what plaque feels like. Plaque occurs when the natural bacteria inside your mouth react with the foods and beverages that you consume. This chemical reaction is the state change in which oral bacteria go from being helpful to your mouth to being harmful to your smile. Dental plaque is a sticky substance that needs to be removed from the teeth every day. If you brush your teeth regularly yet you do not floss every single day, your teeth are nowhere near as clean as you think they are. By not flossing daily, you are allowing dental plaque to build up and assault your teeth, gums, and entire oral health. As the bacteria inside your mouth change into dental plaque, they begin producing acids. All acids are infamous for destroying whatever is in their path – and this includes the acids inside your mouth. As plaque sits on your teeth, the acids produced by the congregating bacteria will begin eating their way through your tooth enamel. This is how cavities are formed: they are small holes in the teeth caused by the acid break down of dental plaque. Dental floss is the only tool that is specifically designed to remove plaque from the teeth. Dental floss slides underneath the plaque and scrapes it away from the teeth and out from between the teeth. Flossing is the only way to prevent plaque from building up on your teeth between dental visits. If you hate having your teeth scraped at a dental cleaning, flossing regularly is the best method of prevention! At Gold Hill Dentistry, we encourage you to fight against your mouth’s worst enemy by flossing daily and keeping regular dental appointments. 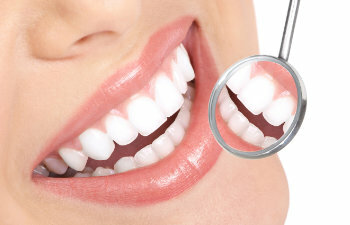 With proper care of your teeth, your smile can last a lifetime!